Birds have been the sign of life since the time of the Bible: Noah himself sent out a bird from his ark to search for life. And that's what birds do best, at their very essence: they fly to find life and let it flourish. 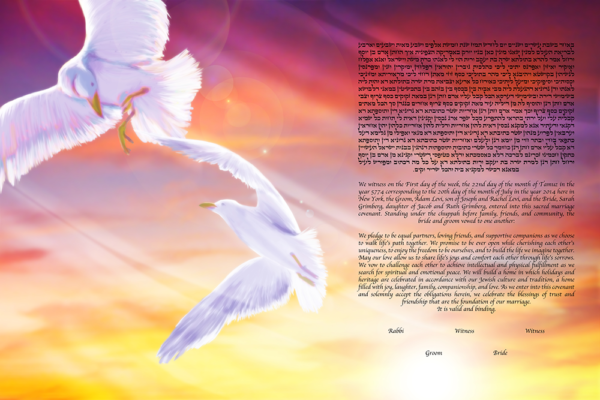 The Flying into the Dusk Ketubah is perfect for the couple who loves the symbolism of the birds flying together but wants to take them to the next level: the birds uniting together and finding life together, just as you two will find life together as well. And as your search for a land to touch down on and build a home together grows, you two will simultaneously be able to soar higher and higher.